How to describe this tea experience? This spring 2010 Gao Shan Hong Shui (or Hung Shui) has the aroma and taste of plum and baked apricot. Caramelized layers surprise me, coming from a flaxen gold liquor. It doesn’t have nearly the darkness that I’d expect in a similarly aromatic Tie Guan Yin. The aroma is heavenly, especially in the mouth. I shared it with a friend in the teahouse and he pointed out, quite rightly, that while it’s undeniably roasted, it doesn’t have any hint of the sharp toast or charcoal flavors present in a Shui Xian. There’s a bit of the honey taste of a good Bai Hao, but it doesn’t come across as floral. The fruitiness is similar to a really delicious Mi Lan Dan Cong, but lighter in body. What a wonderful mystery this tea holds! My heartfelt thanks to Stéphane from TeaMasters for introducing me to this tea. I suspect that I never would have heard of it otherwise. It doesn’t seem to be a popular style, and there’s still quite a lot that I don’t know about it. This particular leaf is from San Lin Shi on June 3rd, 2010 (another gift from Stéphane is knowing the exact date of harvest). From what I know, Hong Shui (红水, literally, red water) is a process and not specific to cultivar, although as it is grown in Nantou province it probably is mostly Qingxin. The leaves are more oxidized than a standard Dong Ding style, and are then more deeply roasted. The roast is clearly done very carefully, though, to avoid any overly toasted taste creeping in. All of this meshes nicely with what Stéphane has written, so if you’re interested in more on the topic, please read his blog. 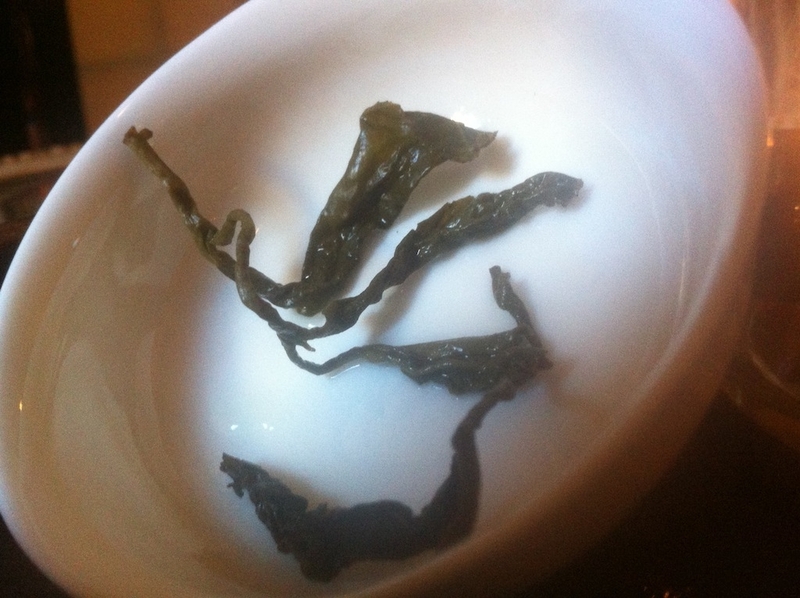 This entry was posted in Tastings and tagged hong shui, oolong, taiwan, tea on September 17, 2013 by payton.